Secret Of Flight is from Mansfield, Ohio and consists of Jamie Ferguson on guitar, Dave Kemp on bass, Dustin Yockey on drums, and Chris Hostetler on vocals. On this four song cassette, the band plays a dreamy style of psychedelic alternative rock. Typically, the guitar picks simple, but appealing melodies that float along with the vocals, and then launch into moments of aggression in which the music ranges from hard edged jam rock, to crunching acid rock. The music never stays in this mode for long though and the listener is soon eased back into dreamland. Of the four songs my two favorites are "I've Seen Gravity" and "Spill". "Gravity" has some nicely ethereal guitar playing and it is this element that most appeals to me. The singer reminds me of a trippy, laid back Bono which I suppose is what gives the music the alternative feel. The aggressive moments have a real drugged out jam rock sound and some brief, but cool screaming guitars. "Spill" is the most aggressive of the four songs and when the band rocks out they get downright acidic. Overall, Secret Of Flight does a good job of interspersing harder edged moments with the more predominant easy going melodic portions. However, the rockin' moments are all too brief and I'd like to hear what happens when the band goes off into an extended jam. They certainly sound like a band that needs to be heard live. 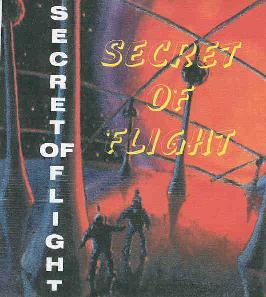 You can visit Secret Of Flight at their web site.